In emergency medical situations, such as shock or hypothermia, keeping the patient warm can make the difference between life and death. 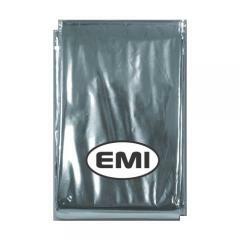 The Thermal Rescue Blanket from EMI is made from an aluminized material that reflects ninety percent of body heat back to the wearer. It is flexible enough to wrap around the patient easily and also highly weatherproof. The blanket packs down tightly, able to fit into a jacket pocket or trauma kit, but when unfolded it expands to an impressive 52 by 84 inches. Every outdoorsman and emergency responder will benefit from incorporating EMI's Rescue Blanket as a vital part of their survival/first-response kit.